The Growing Well card set consists of 50 laminated write on/wipe off cards with key statements that can be used as indicators of mental wellbeing. As well as the statement, each card features a scale made up of six small boxes with an illustration inside each box. The illustrations show the six stages of a seed growing into a seedling and, finally, a tree. Anyone can select a card, read the statement on the card and, if they wish, mark a box (with a non-permanent pen) that shows where they feel they are at in relation to the statement. The cards can then be wiped and re-used many times over. 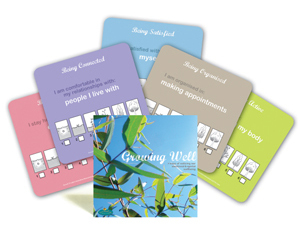 The Growing Well cards can be used in many different settings and ways. They are designed to be used by individuals alone or as conversation-building tools between a professional and a client, or between colleagues, friends or group members. Developed following a lengthy research and evaluation process, Growing Well offers a timeless and accessible way of noticing change and emphasizing strengths. A essential resource for the toolkits of mental health professionals, therapists, psychologists and social workers. Polypropylene box with 32-page booklet. Growing Well is about noticing change within ourselves and others, and provides a foundation for conversations and questions that might otherwise be neglected. Human service workers will find Growing Well useful for opening up ongoing exchanges with people who access their services. This is a tool for conversations about the most subtle of changes, one that also remains grounded in the reality of dealing with mental health issues and measuring change.